Home/Wedding Tips/You’re looking for a DJ, but what you really need is an M.C. But, there is one other important job your entertainment is responsible for that is usually overlooked. The role of Master of Ceremonies (the M.C.). I hear couples all the time at our consultations say they went to a wedding where the music was great, but the DJs ability to lead as the M.C. were poor and uninteresting. Why? Because they’ve had no formal microphone skills training. To some, this comes naturally, but others need training in public speaking or a microphone skills workshop to master their craft. I personally have over 250 hours of training as an M.C. and over 20 years of experience implementing this skill at weddings. 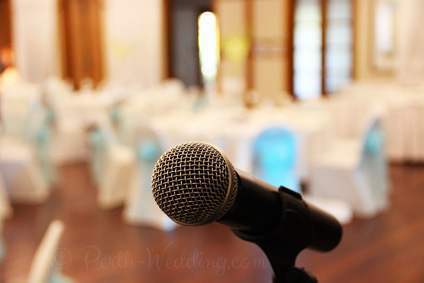 Wedding Entertainment Director, Peter Merry, a leader in the wedding industry and author of the book “The Best Wedding Reception Ever!” says it perfectly – “As the MC, you are the spokesperson for the bride & groom”. An M.C. represents your intentions, controls the flow, and manages your vision while connecting your guests to the celebration. How do we ensure you’ll receive a qualified DJ AND M.C.? Contact us to find out!